Currently on: Thousands of visitors are making their way to the Kumbh Mela to the newly refurbished Prayagraj (formerly Allahabad in UP) for a holy dip at the triveni sangam of Ganga, Yamuna and invisible Saraswati… seeking aache din blessings! Festivals like Makara Sankranti and whatever subsidiary festivals follow are celebrated only to remind us not to take life for granted. By the Hindu calendar the tradition of celebration is observed according to the solar cycles (while most festivals are set by the lunar cycles of the lunisolar Hindu calendar). Interestingly, the day of Makara Sankranti itself falls on the same Gregorian date annually, that is January 14 (except some years when it shifts by a day). The festival is celebrated across the Indian and called variously Sukarat (central India), just Maghi (north India, preceded by the Punjabi Lohri), Magh Bihu (Assam), Pedda Pandaga (Andhra Pradesh), Thai Pongal in Tamilnadu, etc. People revel in the artistry of colours (rangoli), fly kites, make bonfires, cook up nutritiously warming food to share with one and all. 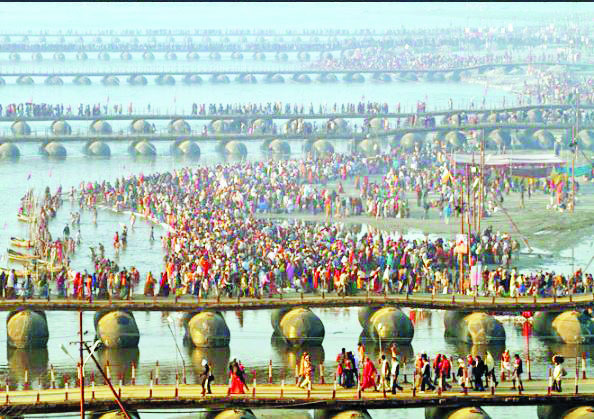 In Indian Hindu tradition the pilgrimage of bathing in the sacred river confluence of rivers Ganga, Yamuna and Sarasvati is a lifetime’s dream fulfilment and so we have the Kumbh Mela, reportedly the largest gathering of humankind in the world come January 14/15 (Makara Sankranti) right up to March 3/4 (Mahashivratri) at Prayagraj (until recently Allahabad). Say it’s a 5,000 year old ritual or one dating back further to 8,000 years and yes, earning the wrath of brutal Islamic invaders in the subcontinent! The Kumbh Mela at Prayagraj has grown from strength to strength with many seeking a bath in the running cool waters from the mountains of the Himalaya. It is on currently and it is every devoted Hindu’s ardent wish to go bathe in the waters of India’s most sacred rivers at least once in a lifetime seeking benediction! The Kumbh Mela pilgrimage of bathing in the Ganga at Prayagraj is attributed to Adi Shankaracharya, although frankly speaking it’s a symbolic gesture taking stock of our water resources be they in the form of rivers, lakes, pools, seas or oceans or even wells! Water, water everywhere and the mighty sun as it shapes all destiny on earth. Alas, in our mod con use and abuse culture of today we neither revere, respect or use water economically and what’s worse, most of the earth’s living potable, sea and ocean reservoirs of water are widely contaminated by our civilization of plastics here, there, everywhere, taking a toll of all innocent life on earth. It is time of change our lifestyles to give mother earth a helping hand to recover, rejuvenate and continue to gift us with her life giving resources anew – if we want to harvest peace on earth. If you’re going to the ardh Kumbh Mela for a holy dip any one of these days please think of all this above all. How to contribute towards rescuing this ancient land from going underground to perdition forever – like Sitamaiya or the river Sarasvati of Hindu mythological fame!